When you arrive at the Charlottetown Airport along with the other freshly landed vacationers, you can’t help but notice that there are more golf bags making the rounds on the luggage carousel than suitcases. That’s because there are two types of t-times on Prince Edward Island: teatime, and tee time. But those are just two activities from a myriad of adventures welcoming you to this shining outpost of marble blue waters, red cliffs and white sandy beaches. Heritage sites, the Confederation Trail, deep-sea fishing, marinas, lighthouses a’plenty and gourmet cuisine greet one and all along the winding Points East Coastal Drive. Easy-to-spot starfish signs dot the route with such frequency it’s almost impossible to get lost. Little wonder we couldn’t even rent a car with GPS on the island: “There’s just no need for it,” they tell you at the car rental. 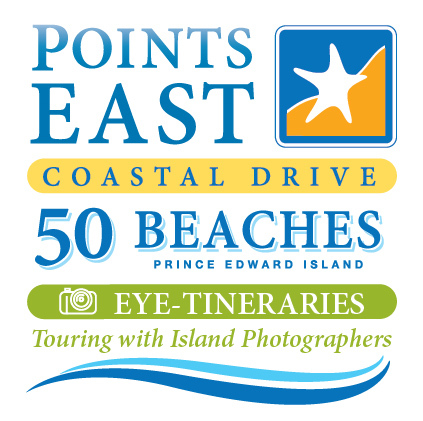 If you’re a history buff, Points East is the place for you. If you’re a golf nut, Points East is where you want to be. If you’re a foodie, look no further than Points East. 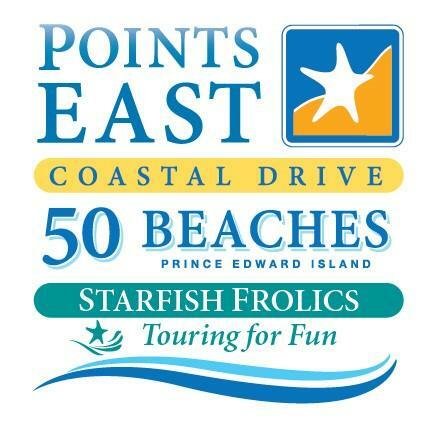 And if you’re a lazy bones who just wants to sit on a beach and read a book all day while the kids play in the sun and surf this is the place to be: Welcome to Prince Edward Island, the land of soft breezes, fine dining and a pace of life that’s as calm and kind as the locals. Rossignol Estate Winery offers maritime vintages of table, fruit and dessert wines, at its lovely boutique amidst grapevines and fruit trees by the sea. Stop by for one-dollar tastings, or, if you book ahead you can have a tour of the grounds and the winery buildings while learning about the process of winemaking. For instance, the delicious Iced Liberty Blossom is made from three types of local apples (Macintosh, Cortland and Red Delicious) that have been crushed and frozen before being fermented. It tastes like apple silk – with a kick. Other Rossignol quaffs incorporate wild, good-for-you blueberries, Island maple syrup and local honey into their award winning wines. This is PEI’s first winery and we subsequently find many of their bottles on wine lists across the Island, including at the Inn at Bay Fortune , which is perhaps the best-known spot for fine dining on PEI which is owned by our one and only Chef Michael Smith. The food here is exceptional: seasonal and close to 100% local, from the eggs of free run chickens at breakfast to dinner’s lamb tenderloin. Check out the expansive gardens that back the property full of edible flowers, fruit trees, herbs and vegetables (making sure to say hello to Casey, the Inn’s pet horse). 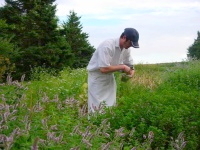 Catch a pastry chef picking some mint for dessert. Rooms are warm and cozy, some with screened in porches, all surrounded by unique maritime ornamental gardens. Stargazing followed by a friendly game of Scrabble in front of the wood-burning fireplace serves as night-time entertainment. For a great lunch stop, Rick’s Fish ‘N Chips and Seafood House in St. Peters Bay has been here over a dozen years and is a must-eat before making the trip back to Charlottetown. Fuel up on Rick’s fresh fried fish, clams, scallops, and PEI twice-fried potatoes, and you’ve experienced the island in all its simple, crunchy glory. Then buy a bottle of Rick’s famous seasonings to bring a taste of the island home. The Inn at St. Peters offers a Great Gatsby-esque setting with contented golfers enjoying perfect sunset cocktails overlooking the bay. Continental Canadian cuisine such as crisp-skinned chicken set upon a bed of creamy barley risotto appeals to a room equally suited to languorous meals with friends, or romantic meals for lovers. 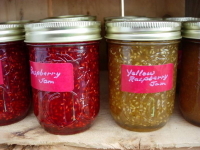 The farm stands dotting Routes 1 and 2 offer us even more opportunity for a taste of Island goodness, from freshly picked local fruits and vegetables and homespun jams, to big bags of the best potatoes in the world -- bet you can’t eat just one! 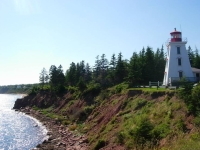 The Cape Bear Lighthouse famously received a distress call from the Titanic, but these days it’s more celebrated for it’s iconic views of red cliffs and Nova Scotia across the Northumberland Straight. Pocket change gains us access to the few flights of narrow stairs leading up to the automated lantern; still used as a beacon for ships in the night. Smell that fresh PEI air and then check out the attached Cape Bear Marconi Station where we wind up the foghorn and surprise other lighthouse visitors! Panmure Island’s grass-topped sand dunes give way to expansive sandy beaches and warm water; the perfect ingredients for building monumental sand castles. A little bit down the road you’ll find PEI’s oldest wooden lighthouse, Panmure Island Lighthouse, a classic structure tucked into a classic setting – waterside views with a horse grazing on wildflowers nearby. The East Point Lighthouse is one of the most visited, and likely the windiest site we encounter on our Points East journey. See lines hung with multicoloured laundry dancing like marionettes, and cyclists struggling against the serious gusts. Little wonder that wind farms are popping up on the eastern tip, harvesting nature’s energy. Buffalo Land Park is a taste of inland beauty. Park the car and take a short walk down the grassy path that leads to a viewing platform, where you can spot a herd of some 100 burly buffalo roaming the lolling fields. It’s really quite something to see them here, just grazing and running about like it’s a perfectly normal thing to do. Buffalo on PEI: who knew? Just across the road is the Harvey Moore Bird Sanctuary. 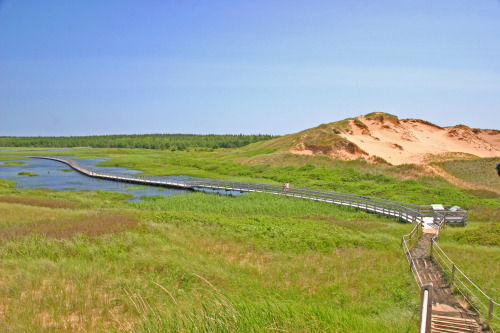 Greenwich Prince Edward Island National Park is a must-stop for a fresh-air outing. Allow lots of time to explore 900 acres of a protected sand dune system and an interpretation centre that explains the natural history of the St. Peters Bay area. It’s another easy walk through trails and along a floating boardwalk, a trail that ends at miles of nearly deserted white sand beaches. They call it Montague the Beautiful for obvious reasons. Montague Train Station and Marina has a gorgeous waterside setting for a quick lunch of chowder at the Station Café, or a more unhurried sunset dinner at Windows on the Water, which overlooks the Marina, and features local wines and fresh Atlantic fish and seafood. Not only is the restaurant delectable, it’s also educational. From the menu, learn that the British settled Montague in 1765, as a commercial centre for logging and shipping. Schooners came and went and before long these narrows became the town it is today. In the Montague river you can see the hoards of mussel buoys, Ask almost any Islander about the “socks” full of famous Island Blue mussels just below the water – there are about 5,000 pounds of the delicious mussels suspended on each line, and there are thousands of lines dotting the river. True to the percentages, the shiny smooth heads of harbour seals pop up here and there. The “rails for trails” program turned old un-used train tracks into a walking and biking path that stretches across P.E.I. 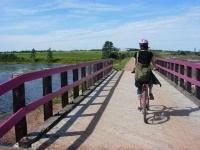 At Confederation Trail Bike Rentals in St. Peters Bay, they like to say that they don’t sell bike rentals: they sell the experience of the Confederation Trail. The bike path runs tip to tip of the province, over bridges, through the woods, mostly along flat, hard packed rock dust. You’ll spot blue jays and many herons by the shore, and if you’re lucky, a family of fox playing in the roadside sunshine. After returning your bikes, head next door to the St. Peters Bay Craft & Giftware, where we meet their “master caster”, the only pewter caster in PEI, and see how she turns liquid metal into solid art. The shop is part of an Island-wide Studio Tour, which allows for both casual drop-ins and booked appointments at some 77 participating artisans and craftspeople, from painters to potters. Finally, for a real taste of Island life, stop by North Lake Harbour – just don’t blink or you’ll miss it. This is the so-called “tuna capital of the world”, a real, working fishing village, where you can sign up for deep sea fishing adventures or just take in the sights and sounds of the authentic Prince Edward Island -- of both yesterday, and today. 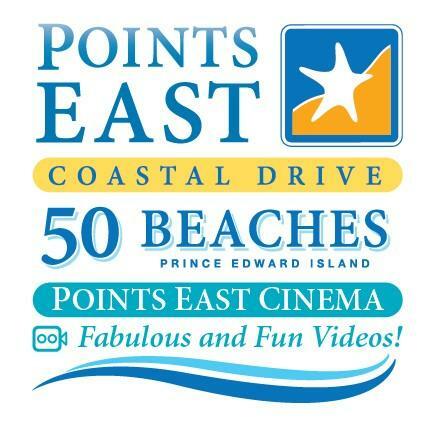 At Basin Head, the Fisheries Museum Interpretation Centre and Gift Shop lead to the beatific beaches -- home to the famous “singing sands.” Walk down the series of boardwalks and see red cliffs to your right, white sand to our left, and the shining Northumberland Straight before you. “It’s a good day out; the sands should sing for you today,” the woman at the gift shop might tell you. The sands sing because of their natural silica content. Really more of a squeak than an enchanting chorus, nevertheless you can hear the sands underfoot as you stroll barefoot down the sprawling white beaches. This is just one of 34 public beaches along the Points East Coastal Drive. 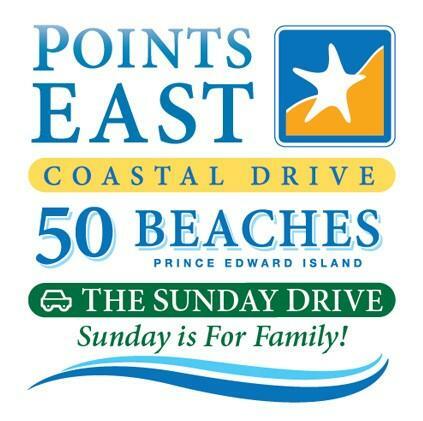 The Points East Coastal Drive begins either on the north shore (Route 2) or on the south shore (Route 1). When heading southeast across the Hillsborough River Bridge, Orwell Corner Historic Village should be your first stop. It’s a preserved historic settlement from 1895, a time when the blacksmith was everybody’s go-to guy (he still is – the current one leaves Orwell at 2pm as he’s also a school bus driver! ), and one-room schoolhouses were the lay of the land. Pop into the Town Hall, which now doubles as a tearoom, for a cuppa, then wave to the horse and buggy rumbling by and visit the snow-white church, and the schoolhouse with its coal-burning stove and leather strap still sitting on the teacher’s weathered desk. Along with the PEI Agricultural Heritage Museum where we see the artifacts and hear the voices of long-ago island settlers, Orwell Corner offers great insight into the struggles and triumphs of PEI farmers at the turn of the last century. After you take in the history, have a picnic at the Scenic Lookout over lolling green pastures and working farmland, and consider the fact that the more things change, the more they stay the same. Roma at Three Rivers is another historical marvel, a Canadian Heritage River site that brings to life the place where Jean Pierre Roma brought people from France to forge a new enterprise in a new land for his trading company. These rivers were like highways to settlers in the 1770s. Today, nine kilometres of intersecting nature trails are laid out for exploring the geographical history of the Three Rivers watershed. You can take a guided tour through some of the pretty treed and flowery trails, explore on your own, or check out the recreated 1700s-style buildings, vegetable and herb gardens and seasonal guides dressed in period regalia. Or, just sit back on a bench and take in that gorgeous view.